When you think about the Meals on Wheels’ clientele, you probably first think of frail seniors. And that is one big portion of our clientele, but we also serve adults with disabilities, adults convalescing from a hospital stay and adults with chronic illnesses. In Ontario, approximately 16.5% of the population has a mobility disability. The predominance of disabilities increases with age. When surveyed, it was noted that most “persons with disabilities (76%) had more than one disability”. Providing meals to adults with disabilities can help them stay at home more independently. For this past fiscal year, 14% of our clients were under 65 years old. One such example of a client with a disability who is part of our younger clientele is Tariq Mahmud. He did not know that he would be eligible for our services before a friend recommended the service to him over a year and a half ago. 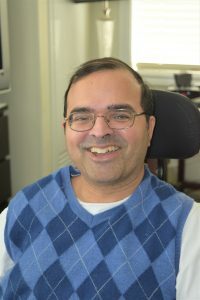 Tariq lives in a Personal Choice Independent Living residence. He receives help from a personal support worker to prepare some meals, but likes receiving Meals on Wheels to complement his meal plan. Tariq likes the food, and says that the delivered meals are well-balanced and available at a reasonable price. Plus, he emphasized that they are delivered by very nice volunteers who take time out of their day to deliver those meals. Younger clients could be individuals with physical disabilities, but may also have developmental disabilities, mental health challenges or be adults convalescing from a surgery. Clients can refer themselves and we always welcome referrals from social workers, doctors, or other professionals who think their clients could benefit from a community support service like Meals on Wheels. Our daily visits in our hot meal program or weekly frozen deliveries can be a welcomed check-in for clients and families. If a client is not home to receive their delivery, Meals on Wheels will follow up with emergency contacts to let them know. This provides more distant family members peace of mind knowing that someone is looking in. Meals on Wheels want to make sure everyone in the community is aware of who can become a client and that new volunteers are always needed and welcome! If you want to donate, have a question about becoming a client or a volunteer, or are a professional working with adults with disabilities who would like more information, don’t hesitate to contact us. Our phone number is 613-233-2424 and our email address is service@mealsonwheels-ottawa.org.